Yesterday was Trick or Treating here and with Colby away, it was up to me to take all 3 girls! I didn't get many pictures, as you can imagine, my hands were very full. But I will get more tonight when Colby gets home to take them out in Concord. When we were done trick or treating, we went over to Lori's house and she happened to have out her bucket of Halloween costumes. 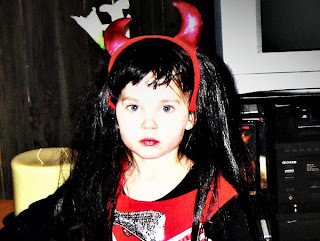 So when Annika had Leslie put this wig and devil ears on her, I had to take a picture. For those of you that know her, it is very appropriate. This kids had a great time getting treats, we went with our friends Grace & Lesley. It was a very cold evening, but of course it didn't bother them. Acadia was very good in the sling and didn't say a word. Annika had tap shoes on and everyone got a great laugh as they could hear the rapid "Click click click click" as she hurried down the road from house to house. It turned out to be a great idea since there was no chance of losing her, even in the dark. She was more fearless then even her sister as she went right into haunted houses and walked right up to the scariest of characters. I had fun too as I watched Lesley (who is fairly conservative) spraying silly string at houses who did not participate in the Trick or Treating. Well, I guess they did participate... just unknowingly in the 'Trick' portion of the night.